To a pasture rich in flowers. The night watch is silent. So silent, perhaps, one can hear the movement of the stars. And it is in this silence that angels sing. Christus natus est! What were they doing there, those shepherds and those sheep? Why did the angels appear to them and no anyone else that night? Little do we know, and yet we can infer the flockherds were chosen, particularly chosen, to be among the first to whom the Son of God would manifest himself. They would know that He was born among men. Angels were sent by God to them. She lay there, holding Him in his divine littleness, pondering in her heart the meaning of the visits that unfold. The Mother herself adored and loved the Infant Christ. His his first human home and shelter is her body and her maternal heart. He is born now, and we must yet receive him. As this work of hers begins, her work of presentation, hers was his one protection for the cold that comes in desert nights. Amid the silence of the manger, swaddling cloths bind the Son of God to man’s own wardrobe of need. The clothing she prepares for him, the manger bed she lays him in, his early days, all the details are stark simplicity: a human simplicity wrapped in divinity — divinity hidden in human flesh. The Creator is in a cradle. She leads men in contemplation of the wonder of his advent. 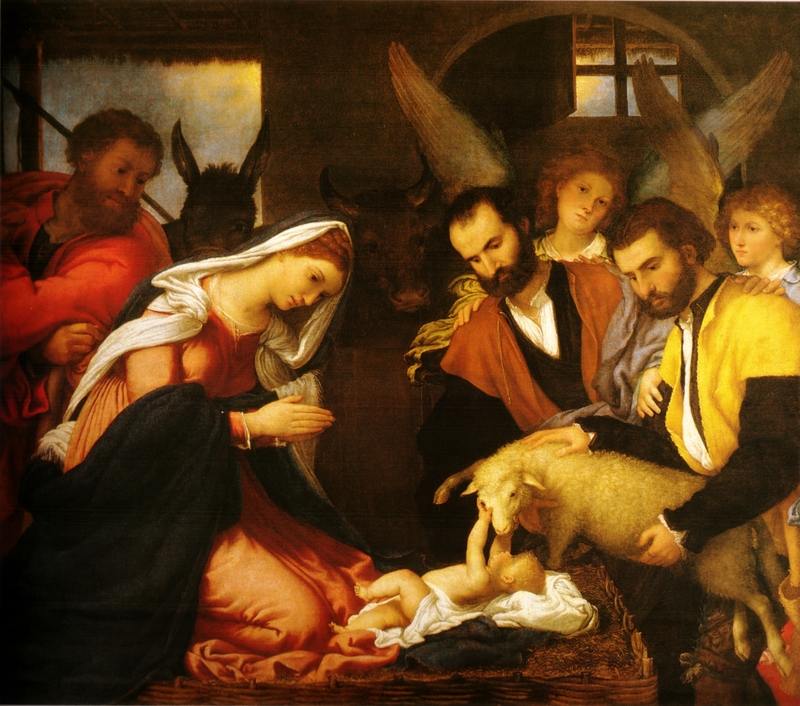 And they and their sheepfolds come to adore this Infant Christ. They act on a natural, organic religiosity whose material continuity extends to our modern skepticism and shatters it into self-reflection. For how could they, the lowest, the wandering tenders of sheep, believe the Savior was born? Why would they come to adore at a straw strewn altar? They are the flockherds of those begging for joy — they who themselves are beggars for joy. They long, and hope, hear and see, and adore. Their wandering life had found its guiding star. Their spirits are untainted by the paralysis of fear and doubt. They, shepherds by birth, by trade, by night, remained themselves un-shepherded. They are like their own lost sheep: heartrending and wandering nomads seeking an ovine resting place. They are called away from the fields to see the stable bed of God. He who made the world and came to live in it lies there lullabied by lambs. It is no surprise that later He would return the favor of their visit by making of them the image of his merciful love — for the warmth of sheep was his first comfort as He lay there beneath the starry desert night. We welcomed him with the offering of sheep, and He beheld the flock as the Lamb who would be led then to the cross. God and sheep exchange a tender gaze that night, and the cradle becomes the altar of sacrifice. Love conquers that darkness and foretells the offering. All would be given for love. Man comes begging, and hope fills the earth. Lost sheep, now found, make for heaven’s joy. Paradise has come to earth in Him. What began in those fields by night, what they saw at the manger on arrival then continues now materially in the wool white host – swaddling bread of angels that holds in its simplicity the full body, soul and divinity of the Savior, and is the answer to human anguish. The Infant Christ remains with us. Do not be afraid; for behold, I proclaim to you good news of great joy that will be for all the people. And this will be a sign for you: you will find an infant wrapped in swaddling clothes and lying in a manger. He came, He comes for lowly souls, for lost souls, for the ignorant of grace, for the angered and despairing, for the doubting and protesting ones yet wandering amid the winters of the world — so to bring them back. Incarnate, He comes to dispel the night of human hearts, to heal the broken, wounded soul, and remains there, we pray, until the day when the begging ends in fullness of joy, abounding. O Thou who in Thy providence has appeared as man and God. Be not afraid. Fear not, O soul, in the night! Fear not, for light will shine the darkness out. Be still and find among the hills a voice of peace. Wander to the heart of love and rest there in the night watch. God has visited his people, and his favor rests on you. Behold! Behold the Lamb of God!